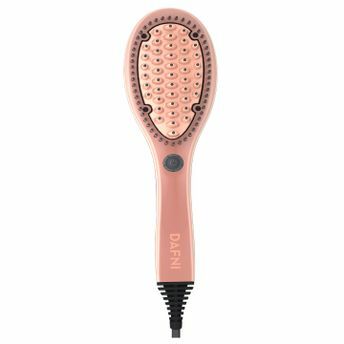 Introducing the NEW DAFNI Limited Edition Hair Straightening Brush, Rose Gold with Curved Core? Technology that transforms your hair instantly! DAFNI is an innovative hair straightening brush, incorporating the most advanced hair care technologies, ensuring easy, quick and safer results. Simply brush your hair and it will be straight and smooth within minutes. No clips or need to divide your hair into subsections. The new DAFNI Rose Gold's curved surface allows you to capture more hair in each stroke and is much quicker than traditional straightening hair tongs. The curved surface perfectly complements the curvature of the scalp to achieve maximum efficiency from the root to the ends of the hair. Top recommended a healthier temperature of 185 ? - No more burning and singeing your hair!